Colt Ford opened for Florida Georgia Line at the Pepsi Grandstand at the Missouri State Fair on Wednesday, August 14, 2014. 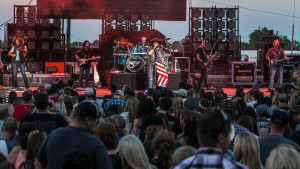 A sold out crowd of 12,000 packed the Pepsi Grandstand Wednesday night for Colt Ford and Florida Georgia Line. Both artists have had a lot of success with their latest albums and garnered consistent radio play. Fans filled the Grandstand, turning it into a sea of plaid. Ford’s July release, “Thanks for Listening,” debuted at 23 on the Billboard 200 as well as number two on the Top Country albums chart. FGL’s 2012 release, “Here’s to the Good Times,” has been certified double platinum, selling nearly two million copies. It was the busiest the Grandstand has been in two years, with people packing the house long before Ford took the stage. Throughout the day, I noticed Facebook and Twitter posts requesting tickets to the sold-out show. It was surprisingly busy for 6:30 p.m. on a Wednesday. As the sun set and a light breeze picked up, Ford and his band took the stage. Fans all the way to the top row of the Grandstand were on their feet and screaming. Ford has a very unique style, most easily described as country rap. He spent most of his set positioned at his microphone stand, comprised of a steering wheel base, shotgun pole and an American flag hanging just under the microphone itself. Ford’s set was bass heavy, reflecting his style of music. Matching the two electric guitars was his fiddle player. The band had fans on their feet and bobbing to the sound the entire time. Ford’s delivery may be untraditional, especially compared to the other country acts at the State Fair this year, but the message is the same. The focus of his lyrics is on family, faith, cars, women, and having a good time. Between songs, Ford was always interacting with the crowd. Any mention of Missouri, Sedalia, or the State Fair ignited screams throughout the crowd. The crowd was swaying and singing along through the entire set. Even an usher was singing along as he was directing people to their seats in the track area. Before singing the song “Working On,” Ford spoke about taking care of our veterans and PTSD. The crowd erupted into cheers as it undoubtedly hit home – the 1-135th Attack Reconnaissance Battalion stationed at nearby Whiteman Air Force Base returned from a deployment to Afghanistan in February. Late in the set, one of the guitarists played the opening chords to “Welcome Home” by Coheed & Cambria. My ears immediately perked up. I was unsure if they would cover the song or not. After those opening chords, the band went right into “Lose Yourself” by Eminem, which Ford covered with his country style. Ford received a standing ovation as he left the stage. Fans immediately went off in every direction. Men with belt buckles that rival WWE championship belts grabbed refills on beer, girls wearing short shorts and cowboy boots were taking selfies with the stage as the backdrop, and everyone was hitting the restrooms before FGL – there was a line more than 50 people long to the men’s room. Just after 9 p.m., the lights dimmed and the crowd went bonkers. FGL came out to Imagine Dragon’s hit single “Radioactive.” As the song finished, a huge bout of smoke blew over the stage and an FGL graphic appeared on a giant screen behind the stage. The eight-piece band features two singer, three guitar players, a bassist, drummer and a talented musician who played everything from mandolin to keyboards. The crowd was uncontainable. Dancing, standing on chairs, and filling up the aisles as they went wild to the music – an usher and two Missouri State Highway Patrol officers patrolled the aisles of the track to ensure everyone remained well-behaved. In a stark contrast to Ford’s subject, FGL hit the crowd right where it counts. Most of their songs are focused on drinking and having a good time. Singers Brian Kelley and Tyler Hubbard were even taking pulls from a bottle of Fireball on stage. They did play a few songs that went back to the country origins, such as “Dirt,” that focus on planting roots. The fans reacted in kind, holding up their drinks and making sure they had a good time. In the row in front of me, a group of six people all had their hands around each other and swayed to the music. Late in the set, the duo prompted the crowd to get their cell phones out and hold them up, illuminating the entire Grandstand.